Little House Neighborhood SAL: I am back! Finally I am back home! We ended up extending our vacation of an additional week. The place was so delightful, the weather so sunny, our kids so fond of mountain life, so that we decided to stay away some additional day. I have been missing you all, and I am so happy to see that our "SAL-Family" is increasing day by day! 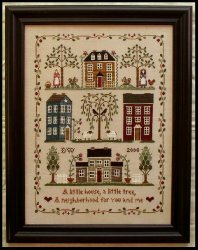 It is a real joy to share my "Neighborhood stitching" with so many stitchers and friends! I have just seen that you all are doing such a great work! I am really delighted admiring all your progress! I hoped to be able to do more stitching during my holidays, but vacations with kids are rather busy! ;-) In a couple of weeks schools are re-opening in our area and then I hope to be able to have more time to stitch. 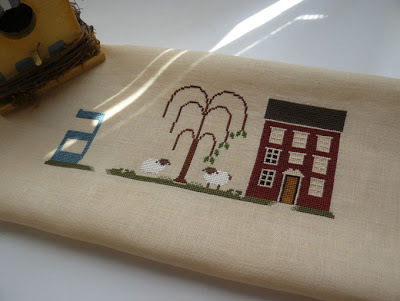 I had also an "accident" with my needlework, that slowed me up still further. This is my little progress...Thanks for looking! What a shame! I wish you quick fingers so you can catch up again. What you have done so far looks lovely though! I am glad you enjoyed your holiday. Oh my, I'm so sorrie to hear about the accident. At least now all the frogging is done and your restart is pretty. I'm STILL waiting on my fabric... LOL! Oh Monica it sounds not good and I'm also sorry about it happened! I don't think I could have unpicked it and started again, your re-start looks lovely. I am still doing some frogging myself.